The below artworks are the most important by Adolph Gottlieb - that both overview the major creative periods, and highlight the greatest achievements by the artist. Artwork description & Analysis: This painting consists of a loose grid structure within which are fragmented and overlapping female forms that have been abstracted into flat lines and shapes. Additional spirals and geometric shapes, as well as squiggles and an arrow (that might suggest male elements or the pathway leading out of the structure and confinement) fill in the remaining picture space. Scholars often point to the pink and brown colors as the remaining influence of the colors the artist had absorbed during his visit to Arizona, although one could as easily point to the pink color and organic shapes of Willem de Kooning's 1945 Pink Angels, or the work of the Surrealist Andre Masson, for example. In 1943 Gottlieb coauthored a letter to the New York Times that advocated the rejection of depth and illusion in favor of the honesty of two dimensions, and asserted that while geometric abstraction had reduced painting to a purely intellectual exercise, that art should be an expression of thought and the human experience. Thus, in this painting there is a soft and painterly texture to the surface that humanizes the geometry, communicating to the viewer the significance of our own personal existence within humanity as a whole. Artwork description & Analysis: This painting is typical of Gottlieb's Pictograph paintings with the geometric compartmentalization of the flat space and its use of seemingly mythic signs and symbols. Though the symbols seem archaic, Gottlieb invented most of his symbols, carefully avoiding specific historical precedent and narrative (although many of his titles refer to Greek mythology). 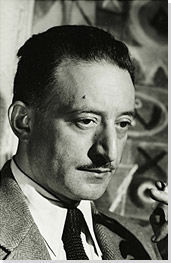 Instead, Gottlieb intended for his images to transcend the barriers of culture, time, and language. He was interested in the psychology of both Sigmund Freud and Carl Jung, believing that "universal" symbols have the power to unlock the collective unconscious of viewers. Vigil confronts us directly with several mask-like faces that suggest Nonwestern sources (African, Sepik e.g.) against a dark background that suggests night, and perhaps the need to be watchful. The disembodied eyes might function as talismen, or, in the context of the Oedipus myth about which Gottlieb painted a series, they could also refer to blindness. The theme of seeing vs. blindness is emphasized by the dark background, and simultaneously augments the meaning of the title suggesting that vigilance counteracts blindness. The added lines and geometry help unify the picture, "mapping out" a possible course of action for the viewer. Artwork description & Analysis: Gottlieb began his Imaginary Landscapes series in 1951. Here, the artist explored the question of depth by creating a canvas split by an apparent horizon without a true illusion of space. Vestiges of his pictographs, including automatic writing and figures, emerge from the earthy tones of the lower portion of the picture in contrast to the solid block of color inhabited by ovoid and rectangular shapes at the top of the composition. The absence of the grid structure from Gottlieb's previous works draws new focus to color and form over symbols. This stylistic shift is reinforced by the Imaginary Landscapes' addition of brighter tones and colors than the earlier Pictographs. Both expression and content are implied by the frail nature of the barely indicated "pictographs" embedded in the figurative portion of the picture, while the shapes hover in the upper portion, aloof, but insistent. Artwork description & Analysis: The first of Gottlieb's Unstill Life series dates from 1948, but this is a larger and later work from the same series. One can see how the painting relates to his earlier work with its pictographic elements and vestiges of a grid. Here, Gottlieb employs an uncompromising degree of abstraction and modern slickness with its palette of blacks, grays, and reds. Additionaly, the picture's increasingly abstract and gestural line work within the emphatic dividing lines now read more ardently on the surface as a sort of matrix as opposed to a grid. The negative space also comes more into play to contrast and balance the painterly interior sections of the composition. The painting's movement and pulsation, sharply contrasts with the apparent flatness of the painting's design, reflective of the title of the series. Artwork description & Analysis: Beginning in 1956, Gottlieb's monumental Burst paintings developed from the Imaginary Landscapes, focusing on a simplification of space and color from the earlier series. Though the more typical palette for these signature paintings consists of reds and blacks, Blues similarly presents a large, vertically oriented canvas in a field of light color, interrupted only by a glowing disc above a twisted solar shape of thick, dark gestural brushstrokes. Depth and horizon are completely eliminated causing color and form to be the sole focus of the picture's field. The polarities of the colors and forms provide the key to the picture -- below, the thick lines that create a moving, "messy," unresolved mass and above, the mesmerizing glow of the pulsating, celestial blues. In 1962, the date of this painting, Gottlieb spoke about the emotional quality of color in his work. Viewing the painting, one is struck by the range of emotional effects that the artist explores through the color blue - progressing outward from the core, the composition's blue builds from subtle and mysterious meaning to an intense and vibrant statement. Artwork description & Analysis: Painted just a year before Gottlieb's death, this is one of the last in this series of Burst paintings. The picture's elongated form echoes the vertical composition of his earlier paintings, emphasizing the empty space between the lower and upper portions of the picture. A warm beige and compressed horizontal zone at the very bottom of the composition serves as a ground for the more delicate and complaisant black, gestural marks pushed against the lower edge. An achingly long distance separates this lower area from the hovering, red orb at the top of the composition, which casts an increasingly pink glow. Gottlieb felt that the space of the picture should function as a matter of the scale and size of the painting - as he said, the space of the picture is "the space that we're confronted with.. in relation to your own size."